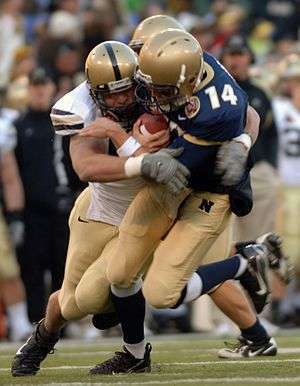 In American football or Canadian football, a blitz is when additional players are sent to "rush the quarterback"—that is, try to tackle the quarterback or disrupt his pass attempt. The term is borrowed from the Blitzkrieg, the German strategy of "Lightning War" employed during World War II. Like the Blitzkrieg, the blitz is a concentration of force at high speed to force a breakthrough and proceed without regard to the flanks. The blitz began with the "red-dog", likely first done by Red Ettinger, sometime between 1948-1950. Defensive coordinator Chuck Drulis is widely credited with inventing the safety blitz. Bill Arnsparger is the likely creator of the zone blitz. On passing plays, the offense always has at least five people blocking. From the quarterback's left to his right, they are: left tackle, left guard, center, right guard, right tackle. The Quarterback will throw the pass, and is not an available blocker. Any other player is available to potentially block, or to be a target for a pass. This is designed as part of the play. Offensive plays have varying levels of protection depending on the play design, and then are modified by the Quarterback and Center based on what they see the defense doing. In this way, they react to the way the defense sets up. The defense can bring all 11 players to blitz the quarterback. This would leave no one to follow and try to stop a target of a pass. So the defense chooses to bring a certain number of players to try and sack the quarterback, and leaves the rest to protect against a pass. Bringing 4 players or less is not considered a blitz. It is only considered a blitz when the defense rushes more than 4 players. By nature, blitzes are risky endeavors for the defense. Since the defense is taking away coverage defenders to rush the quarterback, this usually means that the secondary can't afford to miss any coverage assignments. The defense does not and cannot cover all offensive players, but rather through the blitz, is proactively involved in pressuring the quarterback—specifically, trying to sack him, throw off his timing, or force him to make an error such as an interception or fumble. Advantages gained by blitzing are obvious: proactively disrupt the offense's play before it develops and cause enough pressure on the quarterback to force him into a turnover, sack or incomplete pass. One of those techniques is called "throwing hot," which entails intentionally leaving one blitzing defensive player unblocked. The offensive line usually makes pre-snap adjustments so that the "free" rusher is clearly within the QB's field of vision. This limits devastating blind-side hits on the QB by rushers. When the preparedness of a quarterback allows him to not have to worry about getting hit from behind, it's one less psychological element of the blitz to be taken away, and thus blitz is incrementally made less effective by that particular element.